Posted: Tue Mar 21, 2017 11:13 pm Re: POST YOUR BASKING AREA PICTURES HERE !!!!!!!!!!!!!!! This is my turtle Pool. Looks stupid bc I can't find a large basking dock. Posted: Tue Mar 21, 2017 11:43 pm Re: POST YOUR BASKING AREA PICTURES HERE !!!!!!!!!!!!!!! I don't see a pic attached or linked. Posted: Mon Apr 17, 2017 8:34 pm Re: POST YOUR BASKING AREA PICTURES HERE !!!!!!!!!!!!!!! MEandYouPhoto wrote: Just wanted to post an updated picture of my ATBA. I added a background, a corkbark flat and some plastic plants to the basking area. Now that we have moved his lights so far away from the water we also added a light along the back to light up the lower half of the tank. Your set up is fantastic! 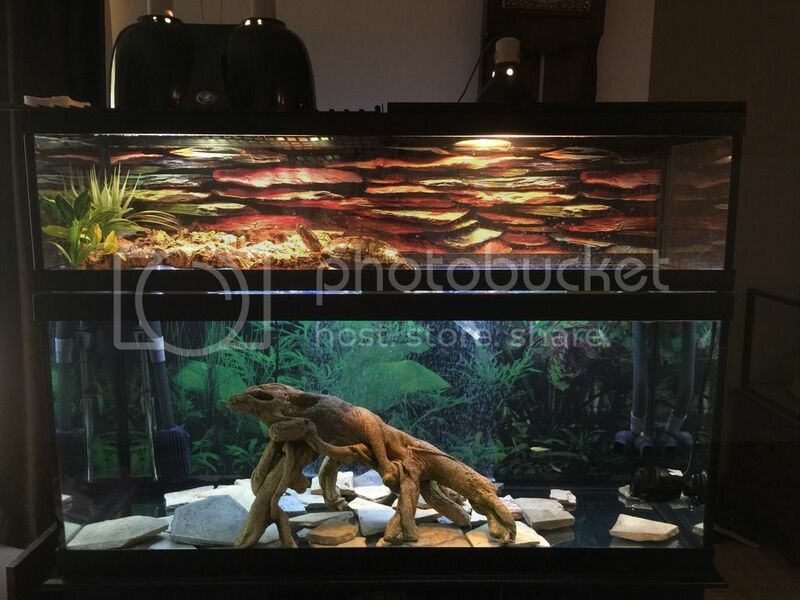 I just purchased a large tank and I want to have an above tank basking area like yours. I intend to order one but I'm not sure about the hoses for the filter canister. Does this topper cause any issues with the hoses? Posted: Mon Apr 17, 2017 11:10 pm Re: POST YOUR BASKING AREA PICTURES HERE !!!!!!!!!!!!!!! Any topper with 4 sides going completely around the rim will have an issue with the hoses. Most people are using acrylic for their toppers, so making a notch shouldn't be a problem. Posted: Tue Apr 18, 2017 8:58 am Re: POST YOUR BASKING AREA PICTURES HERE !!!!!!!!!!!!!!! Let me throw in my solution for hoses...But my friend did the woodwork. I asked him to make two doors on the back big enough to fit one of those little hang on fish breeders. I now use it for canister filter hoses. Posted: Fri Apr 21, 2017 11:24 am Re: POST YOUR BASKING AREA PICTURES HERE !!!!!!!!!!!!!!! Sorry, not very helpful without pictures. (last pic is before I had a canister filter and both doors were closed. I'm kinda curious how people cut out notches in plexiglass / acrylic. I was told it cracks easily? Also, I don't see how people use plexiglass with no frame. Posted: Fri Apr 21, 2017 12:49 pm Re: POST YOUR BASKING AREA PICTURES HERE !!!!!!!!!!!!!!! Looks very nice! You can use a drill and cut into it slowly. Some masking tape might help with the surface. It does crack easily, so it's best to go as slow as possible. If you use thicker pieces of Plexiglass, it should hold without a frame. Of course there is to be no weight on or against it. Posted: Fri Apr 21, 2017 3:00 pm Re: POST YOUR BASKING AREA PICTURES HERE !!!!!!!!!!!!!!! Looking good , I like ! Posted: Sat May 13, 2017 6:27 pm Re: POST YOUR BASKING AREA PICTURES HERE !!!!!!!!!!!!!!! Piggley made me put his little bridge back. He still hates this tripod , tried hiding it behind the chair but he knew , a no show. But its just to show his bridge anyway. While uploading and put tripod away Piggley was already back basking. Something about that dam tripod? PS : Found Piggley stretched over both parts , guess not sure what he likes better OR does he ! Last edited by litefoot on Sun May 14, 2017 1:25 pm, edited 1 time in total. Posted: Sun May 14, 2017 6:06 am Re: POST YOUR BASKING AREA PICTURES HERE !!!!!!!!!!!!!!! Hah, is it a normal tripod?! Posted: Sun May 14, 2017 10:48 am Re: POST YOUR BASKING AREA PICTURES HERE !!!!!!!!!!!!!!! Just a regular tripod ! As soon as I turned the corner Piggley was back to normal and back on his favorite spot ??? Wonder what he think the tripod is ? Posted: Thu May 18, 2017 9:07 pm Re: POST YOUR BASKING AREA PICTURES HERE !!!!!!!!!!!!!!! 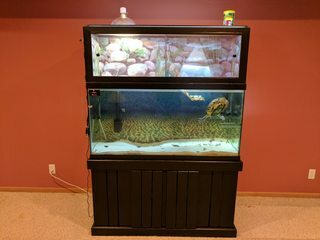 My newly remodeled tank and new above tank basking area. Posted: Thu May 25, 2017 3:39 pm Re: POST YOUR BASKING AREA PICTURES HERE !!!!!!!!!!!!!!! I want to share a recent basking/turtle topper concept a friend and I designed and constructed. It is an all Lexan design that fits on the top of an ~ 55 gallon tank. It is semi enclosed and the ramp angle is ~ 45 degrees and is covered with a polyethylene mat material (attached with velcro) that allows for good grip and traction. A separate internal enclosure can be used as a base or inverted and filled with sand/soil as well. So far, turtle acclimation has been quite favorable. Thanks for looking!! Dr. B. Posted: Fri May 26, 2017 7:34 am Re: POST YOUR BASKING AREA PICTURES HERE !!!!!!!!!!!!!!! Anyone can tell me how to get the material to make DIY platform for the turtle ? Posted: Fri May 26, 2017 11:58 am Re: POST YOUR BASKING AREA PICTURES HERE !!!!!!!!!!!!!!! A Lowes , Home Depot , Full line Hardware store , craft stores , online ... even a dollar store !